3. The BJays are now the most confusing team in the majors. First, they have both Frank Catalanotto and Frank Menechino. Jose cannot remember which is which. Who played for the As? Which is the one that always kills the Sox? Couldn’t they just call them Frank Infield and Frank Outfield? That would be easier. But they had both Franks (note: Euros) last year, so what is it that sets them aside as the single most confusing team in baseball in 2005? That would be the addition of Cory Koskie. Or was it Eric Hinskie? For whatever reason, Jose cannot keep the two of them straight. Presumably it is because they are both third baseman, both have names ending in "ie" and have both killed Jose in fantasy leagues. And now they’re on the same team, except one of them, God only knows which one, is playing third base. But the confusing BJays roster is no accident. No, no!!! Jose is convinced that BJays GM J.P. Riccardi is trying to compensate for a below average roster by trying to confuse his opponents. He probably figures that if opposing pitchers can’t remember which guy is at the plate, they won’t remember whether to throw him fastballs inside or sliders down and away. Riccardi, a Worcester native probably leaned this strategy by watching Sox GM Lou Gorman operate in the early 1990s. Gorman made a run at being the most confusing team in baseball, when he sought to add Greg W. Harris and Mark Gardner to Greg A. Harris and Mike Gardner. (Note: Or was it the other way around?) The attempt failed, so the confusion theory was never attempted. Jose figures that Riccardi is just handling Gorman’s unfinished business. So look for Riccardi to acquire all three Molina brothers before the trading deadline; it’s the logical move, after all. For today's full KEYS please visit wallballsingle.com. Yesterday, Jose got the first speeding ticket of his life. Needless to say, Jose is innocent and plans on contesting the ticket. However, since Johnnie Cochran is recently deceased, Jose will be forced to defend himself. Jose is not a lawyer, a paralegal or even a legal secretary, but he does have a few ideas for innovative strategies to get the ticket thrown out. As you might imagine, Jose’s legal strategy, like everything else in Jose’s life, is baseball related. Jose’s first strategy will be to raise doubts about the accuracy of the radar gun that clocked him at 80mph with a dazzling video presentation. As Exhibit A, Jose will introduce a tape of Game 7 of the 2003 ALCS. Before a stunned courtroom (note: or magistrate’s office… whatever) Jose will play video from the infamous eight inning that shows the radar gun clocking Pedro’s fastball at 97 mph. You know he wasn’t throwing 97, Jose knows he wasn’t throwing 97, the judge magistrate knows he wasn’t throwing 97... EVERYBODY BUT GRADY KNOWS HE WAN’T THROWING 97. And yet there it is – 97 on the radar gun. Geez… it makes those radar guns seem a little suspect doesn’t it? Moreover, to trust the accuracy of the radar gun would be to validate Grady Little, and who wants to do that? But what if the judge magistrate is a Yankee fan? What if it’s Tony Castrati’s cousin and he still believes Grady was right? Thankfully Jose has a second strategy, a strategy based not on evidence, but on logic. Let us suppose for a moment that Jose was going 80 mph. (Note: He was not.) Let us also suppose that radar guns are more science than voodoo. Who is to say that 80 mph is “too fast.” Now, lawyers might say that the Massachusetts General Laws says that 80 is too fast, but the General Laws also say that “Say Hello to Someone from Massachusetts” by Lenny Gomulka and Chicago Push is our official state polka, so what do they know. As Red Sox fans know all too well, B.K. Kim’s fastball has been about 84 mph for the past year. It has been universally agreed upon that at 84 mph, his fastball is simply “too slow.” If the radar gun was correct, then Jose was still driving 4 mph slower than a BK Kim fastball. So how can it be that 84 mph is too slow, but 80 mph is too fast? Answer: It can’t. Jose’s web of logic is inescapable. If B.K. Kim’s fastball is too slow, then it is impossible that Jose was driving too fast. And what if that doesn’t work? What if the judge magistrate is a Yankee fan who loves B.K. Kim? Then Jose will stand up like a man, take his medicine, and blame it all on the flow of traffic. For today's full KEYS visit wallballsingle.com. Let’s talk about corporate consolidation. Come on… it beats talking about yesterday’s crummy outcome. Corporate consolidation is a big deal. As big companies buy other big companies, corporate stalwarts fall by the wayside, jobs disappear and local ownership becomes a hazy memory of a distant age – like the .400 hitter or Tom Gordon’s curveball. Boston has been hit particularly hard by corporate consolidation. The most recent examples are the purchase of Gillette by Proctor and Gamble and the purchase of Filene’s by Macy’s, but it’s nothing new. Remember when Macy’s bought Jordan Marsh or when Bank of America bought FleetBank, which bought BankBoston which bought Bay Bank? 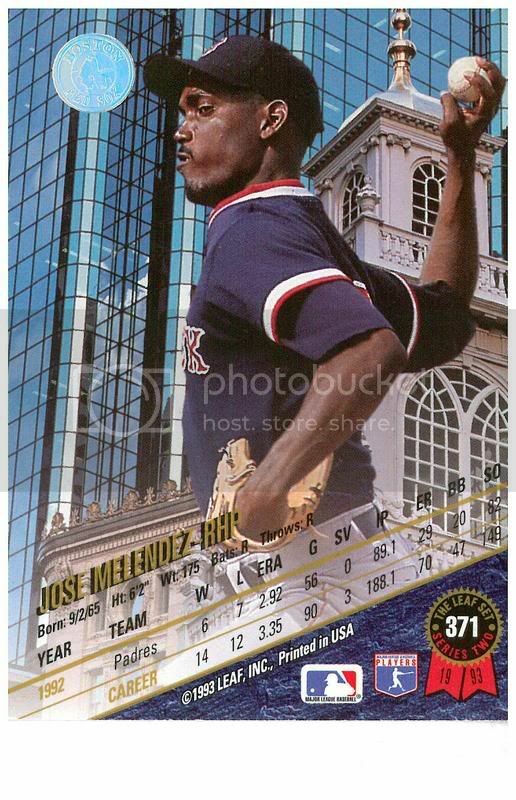 (Note: Jose predicts that within 15 years, there will be only one bank and it will just be called “Bank.”) Even our beloved Red Sox have out of town ownership, though thankfully, they have yet to merge with the Pittsburgh Pirates. The great fear, of course, is that Boston will become a mere “outlet town,” where our fate is completely controlled by robber barons in Charlotte. But let’s not fret. We are not alone. Even a world capital like New York suffers from the same problem. Yes, some of the Big Apple’s most cherished institutions are owned by out of towners. A Japanese company bought Rockefeller Center in the 1980s, Charlotte-based Bank of America ATMs are everywhere and now, as of yesterday, Mariano Rivera is wholly-owned by the Boston Red Sox. For the full KEYS visist wallballsingle.com. 1. File under “The more things change.” After one loss, that’s right, one loss, the Boston media has already ended its love affair with the Boston Red Sox. It’s only one game into the season and, apparently, we already know that David Wells is a bust, Edgar Renteria can’t hit with men on base and Red, White and Blaine Neal is the second coming of Bobby Jones. How bad has it gotten? Today the Boston Globe didn’t even have a Red Sox Notebook. The had a Celtics Notebook, they had an NCAA Men’s Notebook, they had an NCAA Women’s Notebook, they had a Masters Notebook, hell, they even had a Yankees Notebook, but no Red Sox notebook. So either the Globe needs to call up W.B. Mason and order some more office supplies (note: that’s right, the KEYS are doing product placement now. Revenue streams, baby!!!) or the Globe completely stiffed the World Champs. Welcome to Season Two of Jose Melendez’s KEYS TO THE GAME. We are pleased to announce that Season One will soon be out on DVD including: Spanish and French dubbing, director’s commentary, deleted scenes and outtakes, such as one hysterical KEYS where Jose spelled "Mueller" as "Miller." 1. Once, Jose heard a big band jazz album (note: he believes it was Woody Herman, but maybe not) where the band leader, before playing his first chart, discussed how to open a set. "But there is a second option. My option. I say that playing to an audience is like making love to a woman." For the benefit of Misters Jeter and Rodrigues, Jose will explain what "like making love to a woman" means. It means taking your time. It means being deliberate and passionate. It means laying back, sinking into the groove and letting the moment take its course. It is starting a set with "Willow Weep for Me" rather than "Take the A-Train." Tonight, the Boston Red Sox open a set called the 2005 season. Their last set was the greatest in history. It was Dizzy and JJ and Coltrane and Myles together. It was Duke and the Count trading fours. But that set is over, and all that remains is the pleasant buzz of last night’s champagne and cigarettes, that blissful time before intoxication makes its inevitable transition to hangover. But today, there is another gig to make, another set to play. And the fans? They know what is possible. They know just how good it can be. The anticipation builds; the moment arrives. How would you open the set? The thunder of brass? Mellow tugs at the bass? It is Red Sox vs. Yankees, Wells vs. Johnson, Varitek vs. A-Rod, Giambi vs. Nature. No, this will not be like making love to a woman. Get ready for the brass.